The Universal Motorcycle Toll-Pass Mount allows you to securely attach your toll pass to handlebars for easy scanning and use while on the go. This versatile motorcycle toll pass holder is compatible with motorcycle handlebars, risers, crash-bars, sissy-bars- plus it includes a bottle opener ! The toll pass holder is made from an incredibly strong elastic material which will not break or wear out. It will securely hold your toll pass to your bike. Easy to connect or remove, the mount will last for years. 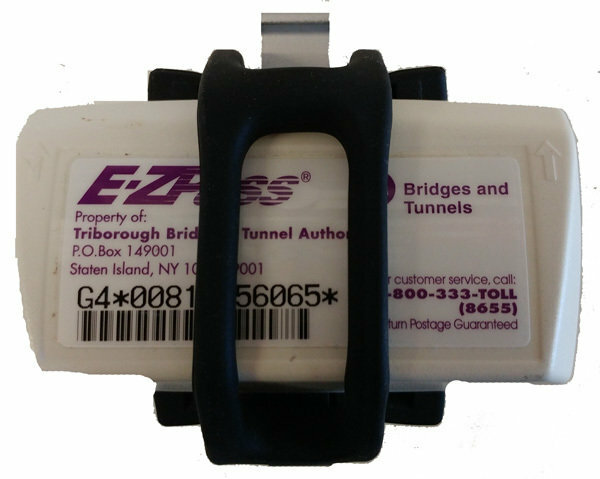 Works with small form factor EZ-Pass, Sun-Pass, I-Pass, Quick-Pass, etc. Made from lightweight expandable silicone with an aluminum base at its core, the single band securely wraps around nearly any sized motorcycle bar. The split-strap design holds toll passes securely. It can be positioned wherever you want, attached and removed as often as you need, and is designed to allow full functionality of your toll pass while it's in place. The flexible nature of silicone gives the device the capability to secure and wrap other objects, too (like flashlights) for added functionality. Simple, versatile, and with a streamlined design, the Toll Pass Holder is perfect on even the longest rides. Bonus: it functions as a bottle opener, too! Universal design fits nearly every small form factor plastic passes.